Truth: the political campaign renders me downright inarticulate a lot of the time. Or perhaps more accurately, I articulate my frustration, disgust, and dismay quite well. But it doesn’t seem to leave me a lot of words for other things. I’ve been busy with quilty things but not posting much. Right now I have Connected on the frame. It’s about halfway through being quilted, but we hit another tension glitch the other day. Two hours of unstitching was the trade-off for about ten minutes of quilting with bad tension. It’s a shame but it’s not fatal. As my friend Lisa says, no one died and no one went to jail, so it’s all okay. Progress was halted but will resume soon, perhaps tomorrow. I think Jim and I are both eager to finish this project and send it to the new owner. A third project is for my small group. I’m delighted that my group decided to do a round robin again this year. Our March meeting is Monday. We’ll pass the center blocks at that time. We agreed again this time to have no real rules, just guidelines. With that, the center block should finish between 9″ and 12″. Mine is a 12″ block. I never know how colors will translate between real life and your screen. The background color is a celery green. The print points have blues and greens on a black background. The center orange strips are quite vivid, the color of a bright tangerine peel. I’ve decided for this project, for all the rounds I add to my groupmates’ projects, I’ll try to work from my scrap drawer. When that fails me, the next option is pieces from stash smaller than a fat quarter, and then from larger if needed. Only as a last resort will I buy. Since we all have different tastes in fabrics, I know buying might happen. But my creativity is engaged most when I have constraints. This constraint will force me to look at my scraps a little differently. How are you all doing these days? Feeling frustrated with current events, too? Making progress on projects? 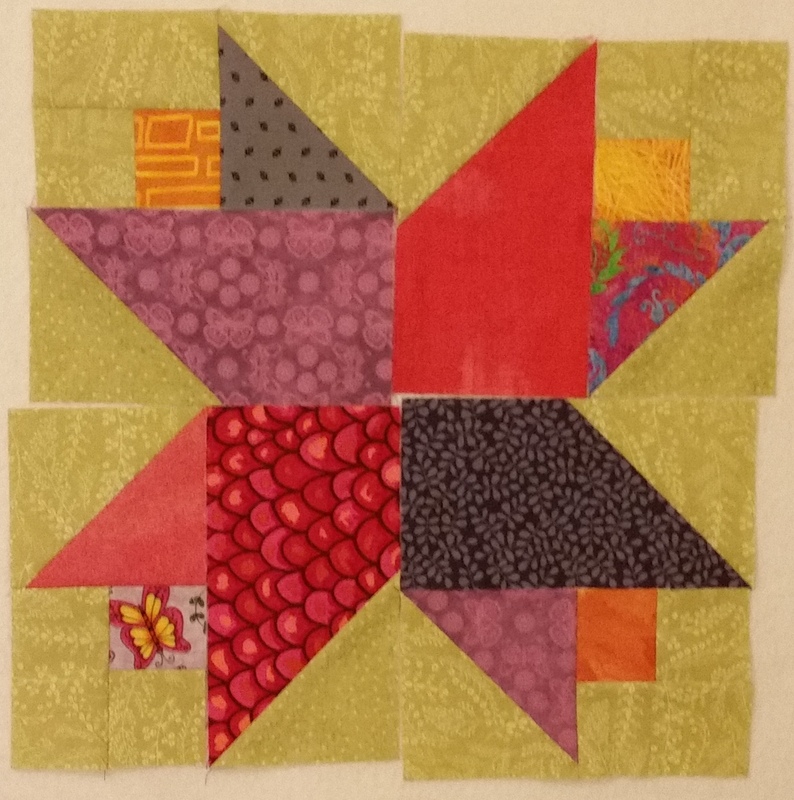 This entry was posted in Medallion Quilts, Quilting and tagged Progress, Round robin, Scraps, Small group, Stash on March 23, 2016 by Melanie McNeil. So many things going on! There are several short blog posts I’d like to write. Instead, here’s a mish-mash of a few. Guests are welcome. I’d love to see you there! Besides that, I’m working on a quilt with my sister Cathie. (Okay, make that two quilts. This weekend we’ll be quilting that hourglass together.) 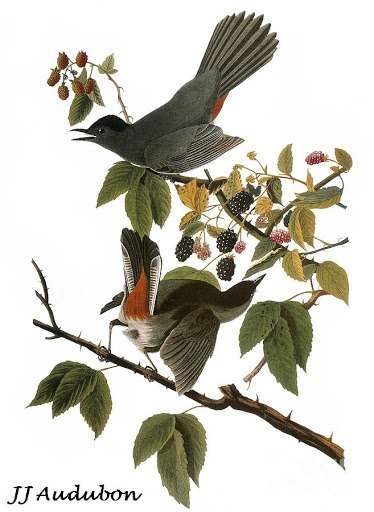 We’ve done “round” robins before, passing a top between us using a medallion format. Today I made some flower block parts for the next border of our current round robin. In fact, I’ll pass the flower parts on to her. Then she’ll get to decide whether to use them or not. Here are four of the blocks (not fully assembled) arrayed on my design wall in a bouquet. I’m a member of the yahoo group called Stashbusters. Recently we’ve had discussions on chain-piecing with leaders and enders. Here is a post I wrote previously about that. Friday is my mom’s birthday. She would have been 83. I keep a picture of her on my wall and am always glad to have her with me. And to the more trivial, I finally got my hair cut this week (!!!) and my new business cards came today. I’m keeping busy. My life is full and I am very blessed. This entry was posted in Creativity, Medallion Quilts, Personal, Quilting and tagged blessings, family, Guild presentation, How sewing machines work, Leaders and enders, Mom, Round robin, Sewing machine history on September 23, 2015 by Melanie McNeil. Bunnies for Baby. 40″ x 50″. Finished June 2015. Photo by Jim Ruebush. In April and May I offered my Medallion Improv! class. To help demonstrate the range of challenges and opportunities medallions provide, I started two quilts. One was Marquetry and the other was the Fairy quilt. That left me with 32 lovely puss-in-the-corner blocks, which wouldn’t be used to frame the fairy. As you can see in the photo at the top, they became part of a baby quilt instead. To 32 pieced blocks, I added 31 alternate blocks. 32 + 31 = 63, which is perfect for a 7 x 9 block layout. It was easy to decide what to use for the alternate blocks. 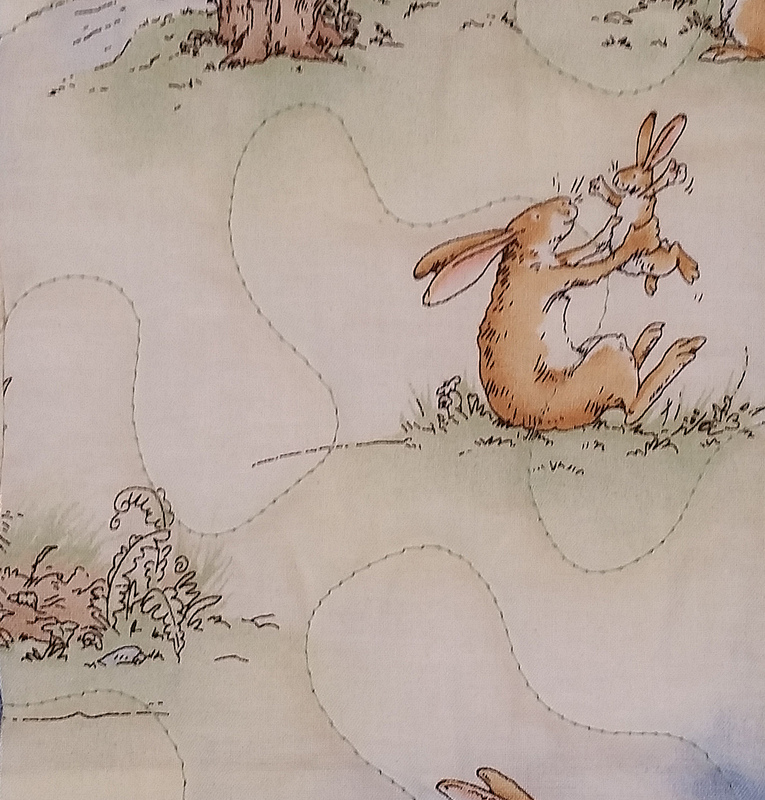 Last year I bought some bunny fabric from the clearance shelf. The illustrations are from the book Guess How Much I Love You. The colors were perfect to go with the pieced blocks. As mentioned above, I actually made two attempts at a fourth border. Besides the puss-in-the-corner blocks, I also made strips using halved variable stars. They were a lot of work! At the time, I didn’t have any idea how I would use the strips. However, they quickly found their place. When I began a round robin with my sister, I realized the strips would work well for the first border, once cut to length. I don’t mind trying multiple options for my medallion borders. I’ve found the rejected attempts, such as the two borders shown above, have their own place. Knowing this makes it easier to stay positive rather than getting discouraged. What do you do with rejected blocks or borders? 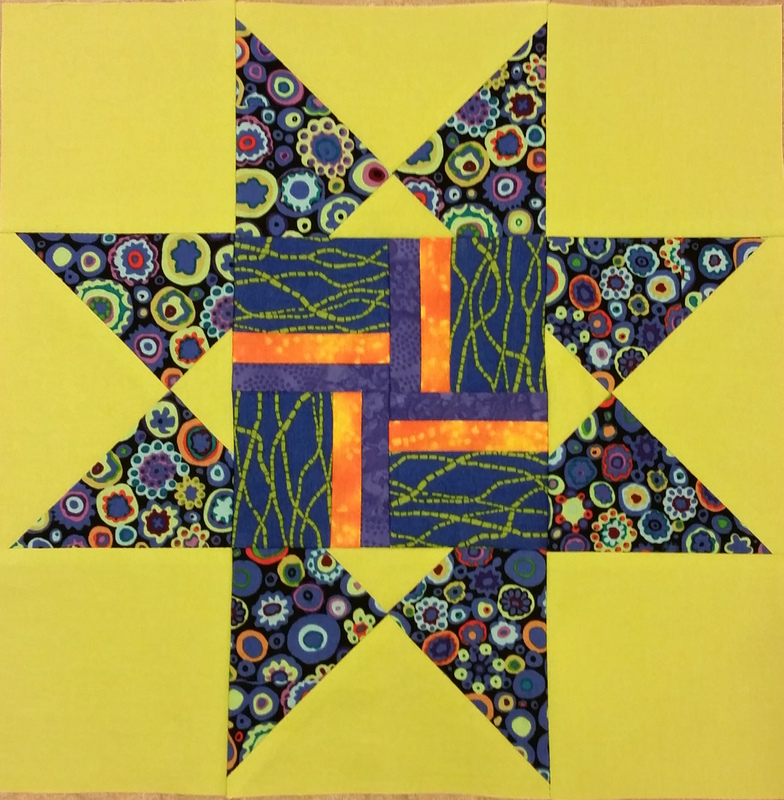 This entry was posted in Medallion Quilts, Quilting and tagged Borders, Design-As-You-Go, Experiment, Medallion quilts, Mindful quilting, Original design, Power, Process, Quilt borders, Round robin, Solving problems on July 10, 2015 by Melanie McNeil. Yesterday I showed you my Flip Side quilt using triangles I’d cut for play. When I made those triangles, I cut 5″ squares, which make finished half-square triangles of 4 1/8″. Why did I cut them that size? Because I was just playing with color and shape and had no plan for using them. When I did use them in a border, I had an odd size. The finished border width was 4 1/8″. To attach them as whole blocks (not whacked off in a “liberated” way), the prior border and next border needed to work with some multiple of that length, too. With 7 blocks along a side, not including corners, the length is 28 7/8″. With corners, there are 9 blocks measuring 37 1/8″. Numbers like these are not easy to work with if you want to use pieced borders adjacent to them. Some of you may be thinking this was easy to solve, and indeed it was. I could have trimmed my HST to finish at 4″. Then I would have had border lengths of 28″ (for prior border) and 36″ after attaching the triangles. But I didn’t. This is an idea of what I was working with. Assume the center block is 14.5″ (another weird size!) and the orange border takes the center to 20.5″. To add the 7 HST blocks evenly on a side (not including corners,) the center needs to be 28 7/8″ long after adding the bronzey middle border. Let me do another example with easier numbers. 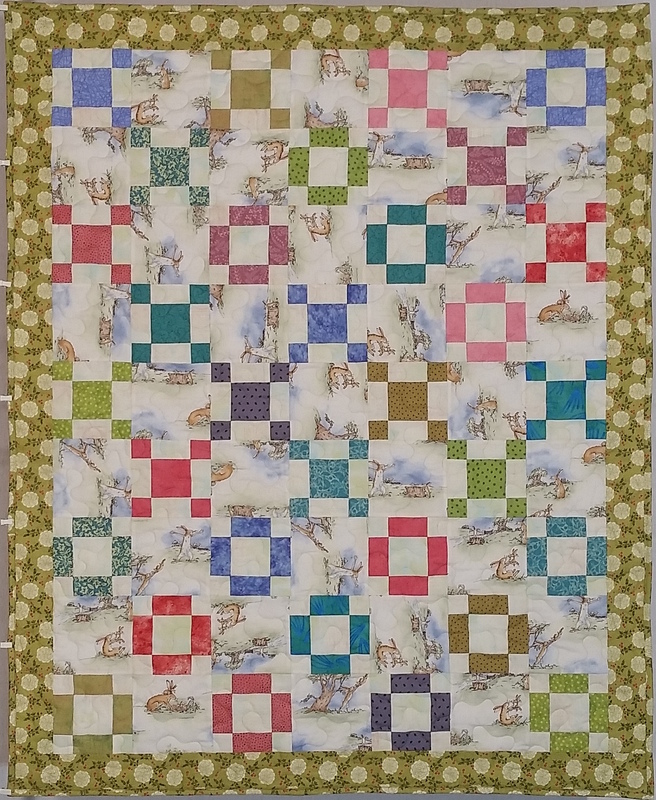 Let’s say on a different quilt I want to use 5 6″ shooflies as my next border. That’s a 30″ long border. And my prior border takes my center to 28″ finished. I will need a spacer border to make the shooflies fit. 2″/2 = 1″. The spacer border will need to be 1″ wide, finished measure. Let’s go back to the Flip Side quilt. What if I’d already attached the bronze border and it was 5″ wide, finished? At that width, the total center (center block, orange border, and bronze border) would be 20.5″ + 5″ + 5″ long, or 30.5″. It is too long to be able to attach the HST border. The bronze border is unpieced strips, so my easiest option is to trim it to make the center smaller. You can see the math is the same whether adding a spacer border or trimming from the center. You might use this method to adjust for piecing accuracy issues, or if you use a border stripe that has an odd dimension, or just to get from one border to another. If you participate in round robins, you know other group members can leave things awkward for your next step. In medallion quilts, spacers often are appropriate just to give a breather between pieced elements, or to add definition to an edge. In block quilts you might need a spacer between the center portion of the quilt and a pieced border. It’s one more tool for your box that gives you more flexibility in your designs. 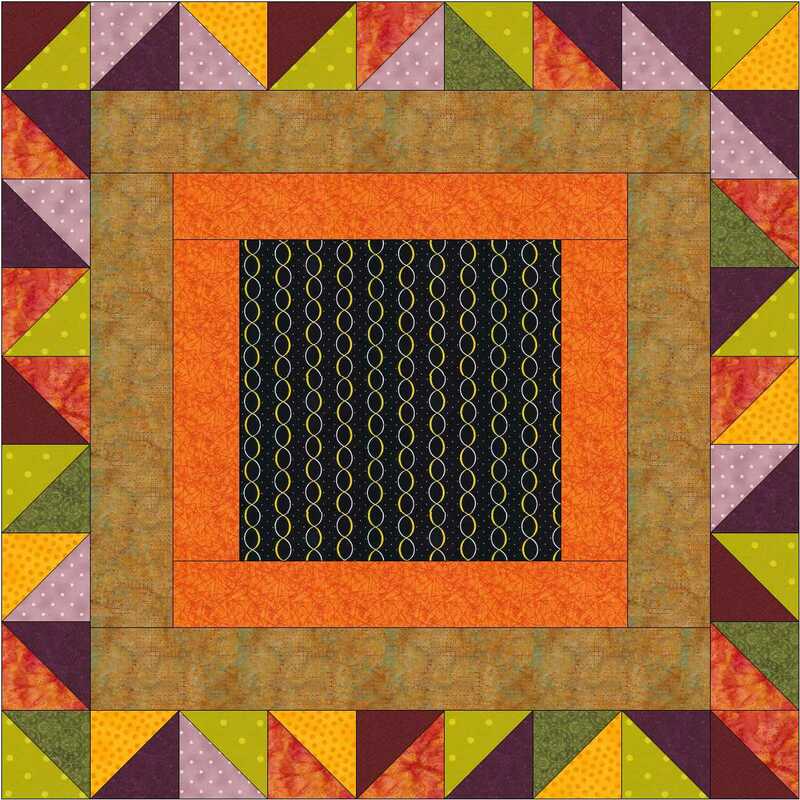 This entry was posted in Quilting, Quilts and tagged Borders, Process, Quilt borders, Round robin, Solving problems, Tips, Tutorial on February 11, 2015 by Melanie McNeil. TBT: Throw Back Thursday, if you’re not up on the acronyms. I’ve been quilting about eleven years now. Most of my first quilts were for grandbabies, with a few graduation quilts thrown in for good measure. All of them were pretty simple, in comparison with what I do today. But they were great for learning some basics. After I joined my local guild seven years ago, the complexity of what I did ramped up. An early challenge I took on was to work on a guild round robin. The service (donations) committee had the center of a medallion quilt and wanted volunteers to contribute borders. 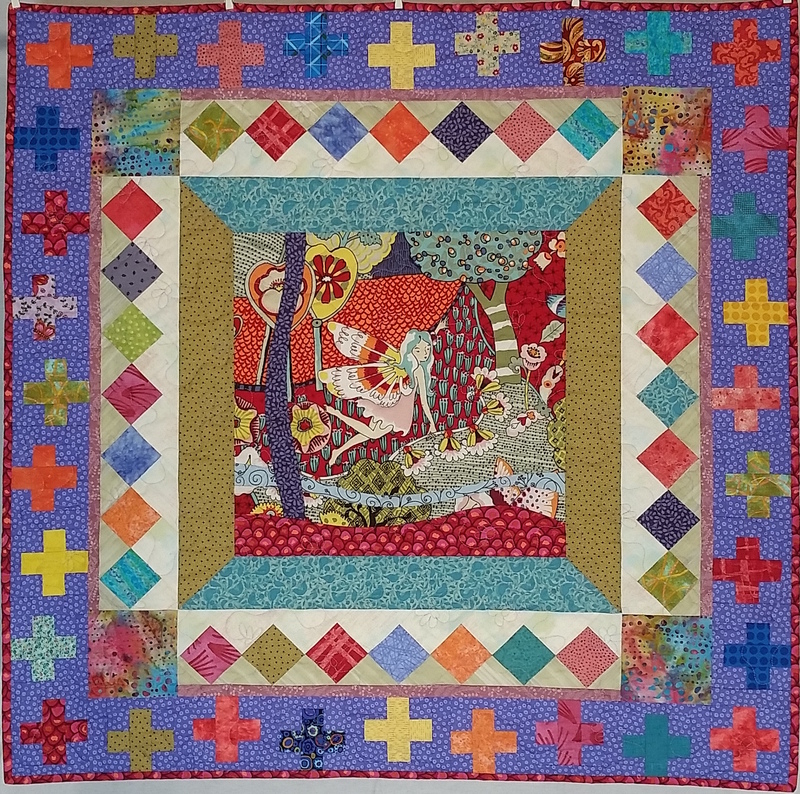 When finished, the quilt was donated to a local organization to use for fundraising. Impetuous me, I volunteered to do the first border. 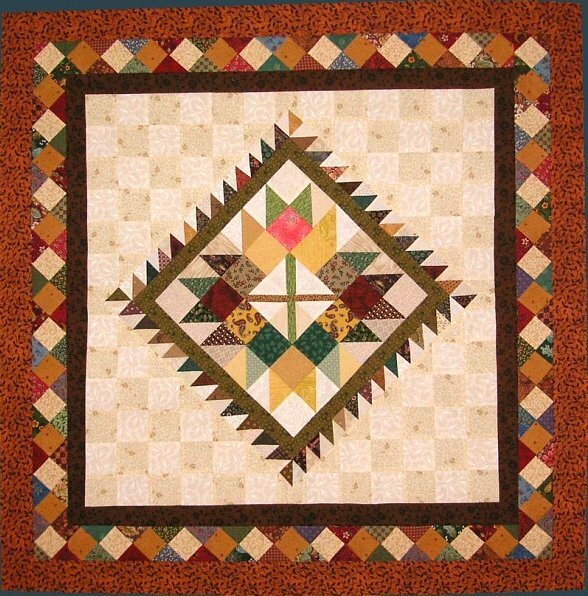 The center as it came to me is the maple leaf blocks, surrounded by tan and cream checkerboard setting triangles. I had no idea how to do the math for squares on point, so I estimated and came up pretty close with my dark gold and tan bead of squares. I framed that with the coppery brown print. In addition, I made several more maple leaf blocks, envisioning how they could be used in later borders. Then I turned the enlarged center, the leaf blocks, and a lot of fabric bits back in. Unfortunately, I never got a photo of the quilt when completed. A later quilter did work in those extra maple leaves I’d made, which was gratifying for this still-rookie quilter. Some of my best lessons came while working with donation quilts for guild. I was lucky to start with this one. 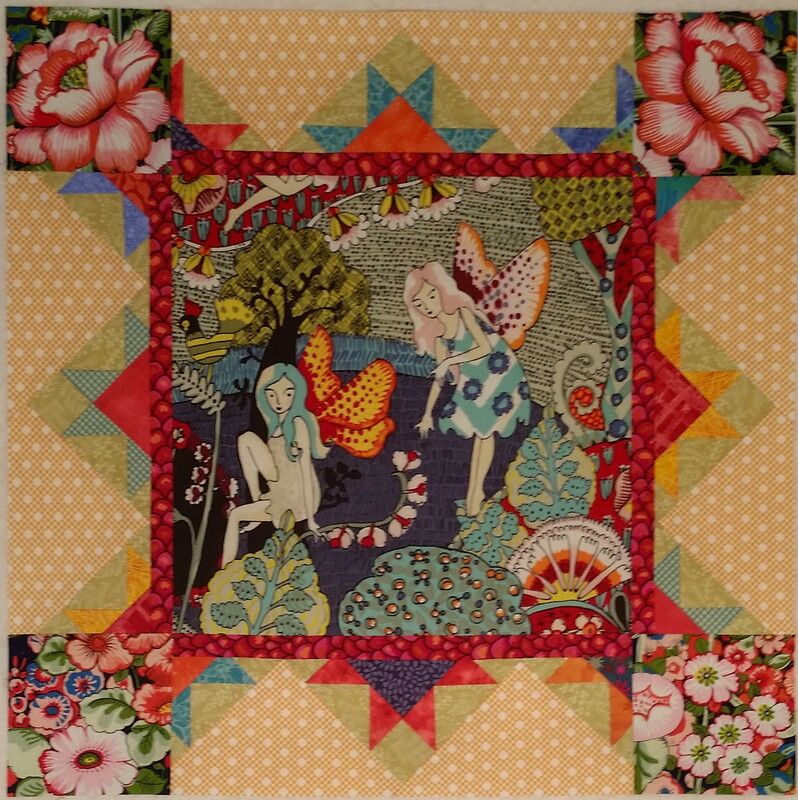 This entry was posted in Quilting and tagged Borders, Center block, Donation quilts, Medallion quilts, Quilt guild, Round robin, TBT, Throw Back Thursday on November 6, 2014 by Melanie McNeil.